The holidays are often an exciting but hectic time filled with parties, travel and social obligations. If you’re among the 68 percent of Americans who own a pet it can be tough to figure out how to keep your pet anxiety-free and happy during the holiday hustle and bustle. Kristen Levine, renowned pet living expert widely referred to as the “Wizard of Paws” and author of “Pampered Pets on a Budget,” strongly believes pet parents can do a few key things to keep pets safe and happy over the holiday season and reduce anxiety for everyone. Ensure that pets don’t have access to any people food while holiday entertaining: Although it is widely known that certain foods are hazardous to dogs, such as chocolate, many people don’t know that other commonly consumed holiday foods, such as onions or raisins, can be toxic to a pet’s health. 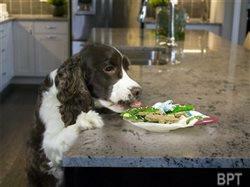 Make sure that all people food is out of reach or that a dog is in a crate when these kinds of food will be present. Keep a dog crated during holiday entertaining or while traveling: A crate can be an excellent way for a dog to feel safe and comfortable. As dogs are “denning animals” by nature, they feel most secure when surrounded on four sides. Knowing that a pet feels comfortable and protected can also help ease stress for pet owners. Further, leaving pets unrestrained while travelling is unsafe for the driver, passengers and animals. Levine recommends American Kennel Club crates that can be found exclusively at Home Depot stores in the fencing section. They are high quality crates at a great price. Learn more at www.HomeDepot.com. Beware of Christmas trees or other holiday decor: A wagging tail can topple a tree or other plants and decor, so be sure to secure them by anchoring to walls or heavy furniture using monofilament or twine. Also, hang breakable ornaments high on the tree so they are out of pets’ potential reach. Another tip: keep your dog crated while setting up the tree and decorating. Many aren’t aware that poinsettias, a popular holiday plant, are toxic if eaten by a pet. Keep a close eye on dogs while opening the door for guests: During holiday entertaining, a plethora of people will be coming in and out of the home and a dog can easily slip out through a door as guests come and go. It is essential to hold a dog’s collar while opening the front door, or have him or her crated as guests come and go. For more information, visit: www.HomeDepot.com.